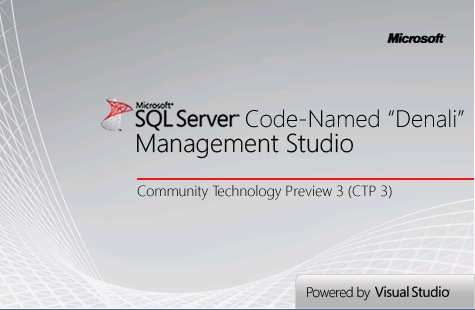 Microsoft has released Community Technology Preview 3 (CTP3) for its next version of SQL Server code named Denali. As I had done in the past, I downloaded a copy and started exploring the new release. The below screen shot is the splash screen for the Management studio. There are plenty of new features in this version of release. I look forward to share those as I stumble upon them. This entry was posted in Uncategorized and tagged SQL Server Denali by Brumedishetty. Bookmark the permalink.